Here at Aspirations we strive to give you the best quality service and support you in bettering your life and general well being. 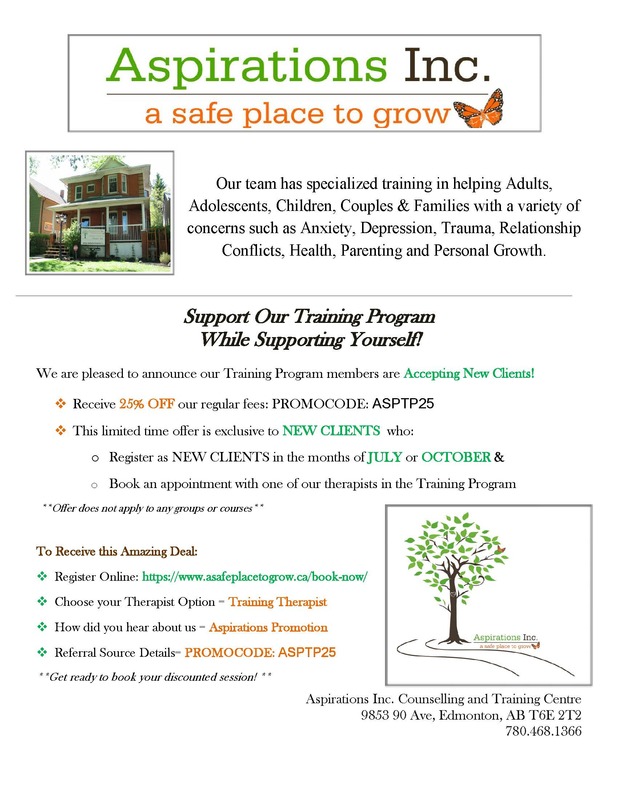 This is why for the month of October we are having a promotion for the training therapists in our practice. Each therapist is supervised by Lynne to ensure you get the most out of each of your sessions and they’re trained in helping in a wide variety of concerns and cases such as anziety, depression, trauma, relationship conflicts and more with adults, children, couples and even families! Don’t wait anylonger to create a stress free lifestyle for yourself! BOOK an appointment today with one of our training therapists to recieve %25 off our regular fees using the promotion code in the flyer above.